Social media was lit up with commentary over the 10-page document, penned by a senior Google engineer, with many progressives in tech calling for his termination. The tech giant’s new VP of Diversity, Integrity & Governance, Danielle Brown, released a statement to Motherboard supporting the document — at least in part — to say that a diversity of political views was important for the company. There’s little to disagree with, or so one would think, but feminists and social justice activists in tech — a few of whom are current and former Google employees — were unhappy with the statement and called on Google to fire the engineer. Jaana B. Dogan, a programmer at the company, stated in a series of deleted tweets that she was considering leaving the company unless HR does something about him. Software engineer Kelly Ellis claims that she experienced discrimination while working for Google. She called for the author to be fired over his remarks. Former Google privacy engineer Yonatan Zunger published a post on Medium to state that had he still worked at the company, the memo’s author would’ve lost his job without question. “You would have heard part (3) in a much smaller meeting, including you, me, your manager, your HRBP, and someone from legal. And it would have ended with you being escorted from the building by security and told that your personal items will be mailed to you,” he wrote. Outsiders looking in, like self-proclaimed “software engineer” and Democratic candidate for congress Brianna Wu condemned Google for not firing him fast enough. 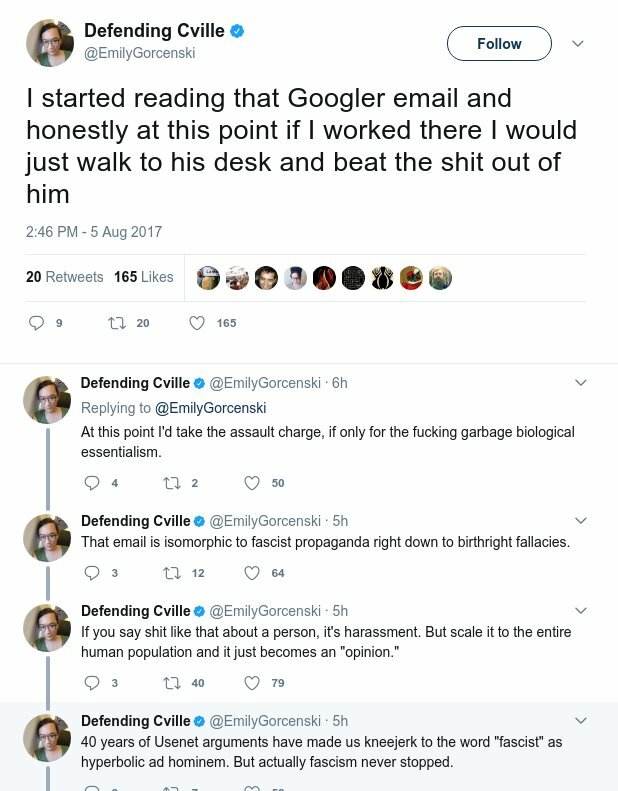 A proud Antifa-supporter and vocal trans activist in tech, Emily Gorcenski, described the memo as a form of “violence” and “harassment.” In a series of tweets, one of which was deleted, Gorcenski called for harm to be done to its author. Google is currently embroiled in a dispute with Obama’s Department of Labor over a wage gap issue, and this latest controversy is unlikely to do any favors for the company’s PR.